During daylight hours, it’s easy for the untrained eye to overlook the most eclectic venue on Edgewood Avenue. Bathed in sunlight, Erosol, better known as ‘Department Store,’ stands quiet and unassuming, biding energy in its brick walls as night slowly approaches.Located at the corner of Boulevard and Edgewood Avenue, Erosol remains inconspicuous to passersby, at least until Event Coordinator Bre Watson opens its doors at 8 p.m. to begin the festivities. A hulking security guard surveys the outside street as a disc jockey warms up and bartenders engage in friendly banter. Although this is a familiar scene on Friday nights, Watson ensures that Erosol offers an entertaining experience for all walks of life. Despite Erosol’s cult following in the urban community, the venue hasn’t always been in such popular demand. Erosol’s owner, Luis Carreras, explained how the business idea came together, referencing the first time he noticed the venue. Even though the venue’s dual naming can sometimes cause confusion for a first-time goer, Carreras said that there is a reasoning behind the names. 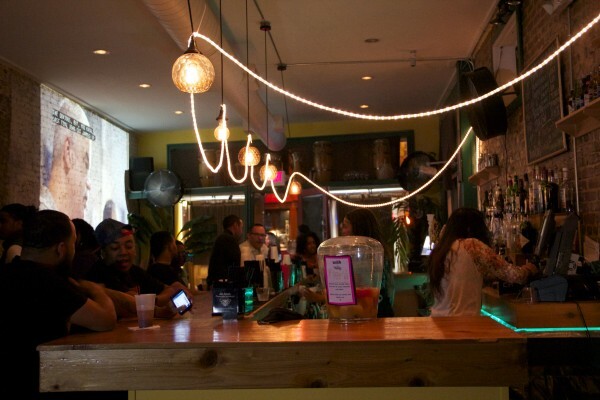 Erosol, also known as Department Store, has flourished into one the hottest bars on Edgewood Avenue. Department Store’s DemographyCarreras felt that it was crucial to establish a place for young creatives in Atlanta to enjoy themselves and network. Erosol keeps a constant ear to the street and has evolved into a cutting-edge rite of passage for burgeoning Atlanta rappers, including OG Maco, iLoveMakonnen and Two-9. Although Carreras is the face of Erosol, General Manager Sarah Kim and Watson are the creative visionaries behind innovative, interactive functions like the weekly “Playlist Party,” which recently featured Georgia State alumni Ludracris as guest host. Watson says that Erosol’s main appeal is its wide array of events and performances, inviting a fluid, ever-evolving demographic. Recent changes to the Old Fourth Ward’s infrastructure have played a large role in Edgewood Avenue’s sudden surge in popular nightlife, with attractions like the Atlanta Streetcar making the area more appealing and accessible newcomers. Carreras is humbled by the fact that Erosol has become a calling card for the creative youth and embraces the challenge of being a trendsetter for Atlanta nightlife.